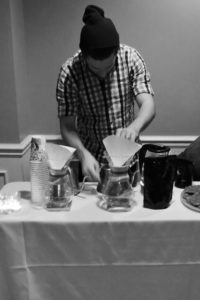 About Us | Gooseneck Coffee Co.
Who Is Gooseneck Coffee Co.? For a few years, co-founders and friends Bill and Noah shared many coffee experiences together. Learning new ways to brew, recipes to follow, and gadgets to buy, they pushed each other and explored the many aspects of coffee. 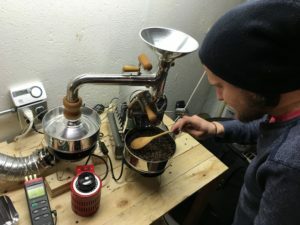 In December 2015 at a Christmas event at their church, they decided to bring some brewing equipment of their own and some locally roasted coffee to enjoy with their friends. Later that evening their wives suggested that the two of them consider starting a small business in the coffee world. After many conversations with each other and other local business entrepreneurs, they decided to pursue roasting and selling their own coffee. This was the beginning of Gooseneck Coffee Co. Some early roasts with our Huky. Soon after that decision, they bought a small one pound Huky 500 table top roaster and began reading and researching coffee roasting. In May 2016 they began selling their beans at the local farmers market in downtown Plymouth, MI. They continue to sell at farmers markets, local events, and artisan markets. While constantly learning about coffee (and there is A LOT to learn!) they both have full time “day” jobs and balance that with family life as well. In November of 2017, Gooseneck was successful in running a crowdfunding campaign that raised over $11,000 in order to purchase a bigger roaster! 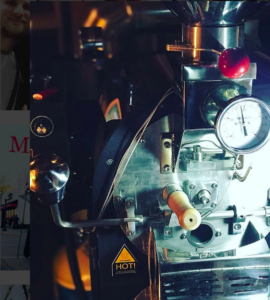 They decided on a 2kg Mill City North roaster (about 4.5 times the size of their first Huky roaster) and have been using it as their main roaster since the spring of this year. You can read more about their campaign by visiting their Kickstarter page.